George Graham Reviews Kate Schutt's "No Love Lost"
The commercial success of Norah Jones and kd lang has helped to pave the way for other women vocalists in a style I call chanteuse with jazzy, or romantic influence. In the jazz world it has resulted in a real glut of albums by female vocalists, most singing jazz standards. But the genre also includes contemporary singer-songwriters, and there have been some noteworthy artists in the field, such as Ms. Jones, Madeleine Peyroux, and Sylvie Lewis. This week, we have the impressive debut studio recording by an American expatriate living in Canada who is also distinctive in the instrument she plays. 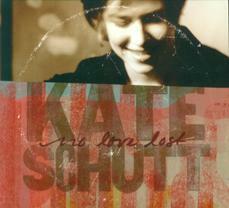 She is Kate Schutt, and her CD is called No Love Lost. Ms. Schutt was born in Chadds Ford, PA, and is a 1999 graduate of Harvard in English and American literature, and also studied at the Berklee College of Music in Boston. She plays an 8-string guitar/bass hybrid, the same instrument for which Charlie Hunter is known. She released a trio of limited edition live albums starting in 2000. In 2005, she moved to Guelph, Ontario, near Toronto, and eventually hooked up with some musicians in the area, including Duane Andrews, an acoustic guitarist in the Django Reinhardt tradition, and trumpeter Patrick Boyle, who were playing a gig together when she first heard them. She invited them to appear on her CD, and the core of the group was formed. Rounding out the No Love Lost's personnel are pianist Mark Shilansky, and Dave Jamrog on drums. Ms. Schutt plays the bass on her hybrid instrument, in addition to her vocals. And those vocals are exceptionally appealing -- clear, light, sometimes playful, and with superb pitch and control. Her style borrows from the kind of innocence of folkies together with the impressive technique of jazz singers. This is definitely a singer-songwriter record. All the music is original, co-written with someone named Tomasin, and as the title of the CD might suggest, it's a collection of love songs that nicely explore different facets of that most prolific topic for songwriters. The compositions are tuneful and lyrically literate. No Love Lost's style is an interesting mix. It's not really a jazz album, but the musical backing features some jazzy instrumentation, with the prominence of the Django-styled guitar and the trumpet, often played with an old-fashioned plunger mute, the earliest kind of wah-wah effect. Also making a subtle appearance is a string trio. Kate Schutt's new CD No Love Lost is a very impressive debut studio recording from a talented and distinctive chanteuse. Her vocals are a mix of jazz sensibility with the kind of charm and whimsy of Rickie Lee Jones, with a folky undercurrent. Her use of the 8-string guitar-bass hybrid, combined with the pre-World-War II jazz influence of Django Reinhardt in the acoustic guitar, and early jazz-style trumpet, adds to the eclectic sound of the recording. And Ms. Schutt is also a fine songwriter, with most of the 11 songs on the CD good candidates for others to cover. Our grade for sound quality is close to an "A." There is a nice intimate sound, free from excessive studio artifacts, and Ms. Schutt's vocals are especially well recorded. But as is almost always the case these days, the recording was volume compressed, presumably to make it louder, robbing the music of the subtle dynamics of the performance. It's always great to encounter a exceptional new performer. Though Kate Schutt has been recording since 2000, making live CDs, No Love Lost is her first time out with a band in the studio, and it's a winner.